The best place to start when putting your website together is the Create Design Studio. It’s here where you will choose one of our templates to set the look and style of your website. Don’t worry though, your template can easily be changed at anytime in Create. A template sets the underlying look and feel of your website, including the colours, layout and font style. Create offers a wide selection of templates to choose from, each with their own distinctive look. 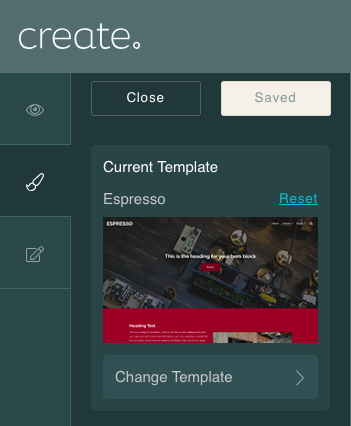 Every template within Create is responsive, so will display correctly on mobile devices and customisable. You can easily change the template of your website at any time. To begin, click on the ‘Design Studio’ option located in the Top Menu. A menu will open on the left-hand side of the screen. It is here where you can choose the template you would like to use for your website. You can preview all of the different themes here by simply clicking on the ‘Preview theme’ button. Nothing is set until you click on the OK > Save option. **Create Tip! ** Not happy with the new template you’ve just chosen? Simply click on the “reset” button to revert to the original template style. Once you have chosen your template, you can edit your colour scheme by selecting "Colours" within "Design" in the left-hand menu. By default, our templates come with a carefully chosen collection of colours that compliment the chosen template, but you can change these to your own choices if you prefer. You can choose the colour element you want to edit and choose the colour you want from either the basic palette, colour wheel, RGB, Hex code or from your saved Favourites. This is great if you have a specific colour scheme in mind to match a logo or existing branding. **Create Tip! ** Looking to match a specific colour? You can enter a colours unique code in the Hex Code field. 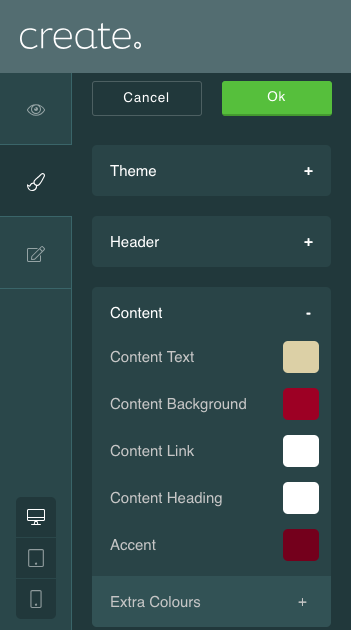 Much like the colours, these have been selected to compliment the template you currently have chosen, but you can change these to your preference if you wish. 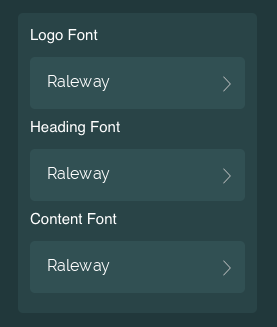 Just click on a font type you would like to change, to open up a selection of fonts to choose from. Some of our templates feature a wallpaper image to complement the design. You can use the image supplied with the template or replace it with your own. Here you can either turn the wallpaper on/off or change it to something else. 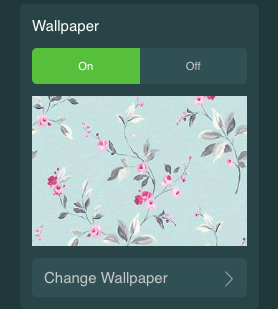 If you click on change wallpaper, you can pick from a wide variety of wallpapers provided by Create or you can select an image you have already added to Create to be used as a wallpaper. After completing the above steps, your website theme has now been selected, along with the colours and fonts. Remember that these can be changed at any time if you happen to change your mind about any of the selections you’ve made. If you happen to have a logo design you would like to add to your website, please follow this guide for instructions of how to add the image. You’re now ready to move onto adding content to your website.